Another summit/LO site hike that Jim joined me for. The best part...new trail. I've never hiked this stretch before. Each time I headed up Chiwawa/Phelps Creek I've seen the marker for Estes Butte. I always wondered what it was like. Now it was time to hike it. Once again...it was cold. Really cold. We started hiking to get the fingers and toes warmed up. The trail...um...road...parallels Rock Creek at first. It's all old road for nearly 1/2 mile. Then a blockage on the road and an obvious switchback to the left...uphill. Jim mentioned an old and steep trail to the top. Looks like the trail was rebuilt (date unknown) so the grade is nice hiker grade. Occasionally we'd see remnants of the old trail taking a more direct route up. Near 4800' the ridge starts to ease up a bit. A few hundred feet higher and still no snow. Weird. It was only near the top that we found a couple of small patches. As we approached the old LO site, the trees opened up giving us some awesome views in all directions. West toward Buck and Clark. East toward the Basalt Ridge area. North-ish was Mt Maude and the surrounding peaks. It was disappointing though to reach the old LO site only to realize the real top of Estes Butte was still quite some way away (TOPO would later tell me about 1.8 miles away). We'd need to drop down and then back up to reach the name summit. Oh well, lookout site usually have great views. This lookout site wasn't any different. We pondered heading over to the real summit but never got around to heading off that way. It would be a good 2.5 to get there and back to the LO site and then the hike out and long drive home. Even this time of year this trail was dry. No creek. The trail is in great shape. Something to keep in mind though for a longer one way trip. Bring lots of water. Jim and I both commented how nice a trail this was and why...why...why we don't see more people hiking it. There was no one else out on this trail the entire day. Jim later told me he searched for TR's but could only find 1-2 trips each year. There should be more! More information on the lookout: This is a former lookout site. 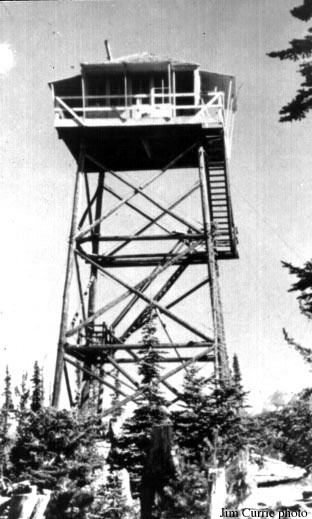 A L-4 cab was first used in 1933 but was replaced with a L-4 on a tower in 1950. It was destroyed 1969.